The rural town of Stockton, New York, is famous for nothing: No one was born there, no one died there, nothing of any historical import at all has ever happened there, which is why Solomon Kugel, like other urbanites fleeing their pasts and histories, decided to move his wife and young son there. To begin again. To start anew. But it isn’t quite working out that way. His ailing mother stubbornly holds on to life, and won’t stop reminiscing about the Nazi concentration camps she never actually suffered through. To complicate matters further, some lunatic is burning down farmhouses just like the one he bought. And when, one night, Kugel discovers history-a living, breathing, thought-to-be-dead specimen of history-hiding upstairs in his attic, bad quickly becomes worse. 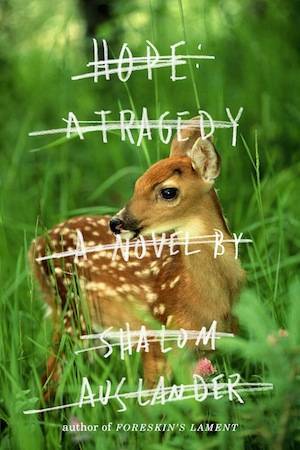 The critically acclaimed writer Shalom Auslander’s debut novel is a hilarious and disquieting examination of the burdens and abuse of history, propelled with unstoppable rhythm and filled with existential musings and mordant wit. It is a comic and compelling story of the hopeless longing to be free of those pasts that haunt our every present. ” I’m an admirer of Auslander’s, and not just because I think he’s onto something. He’s also willfully outrageous, a black humorist with an Old Testament moralist’s heart. “Still, in the end, this remains the novel’s one abiding problem, that its narrative never fully resonates. “For the most part, though, the parts lack complete coherence. They do not gel together to create a larger whole, a novelistic effort.